Here are important formulas and shortcuts to solve problems on ages. 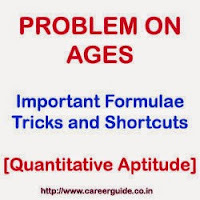 Basic knowledge regarding solving questions regarding problem on ages is important for various competitive exams like IBPS, SBI Bank PO, assistant, SSC exams, Railway exam, UPSC exams. Age of Deepak 6 yeas back = X - 6. Example 1: Rahul's age after 10 years will be thrice than his age 10 years back. Find present age of Rahul? So X + Y = 72 + 36 = 108. Example 3: One year age ratio of Kunal's and Mohit's age was 6 : 7 respectively. Four years hence, this ratio would become 7 : 8. How old is Mohit? Hence Mohit's present age is 36 years. Example 4: If twice the age of Nikita is more than Ankit's age by 4 years and product of their present ages is 240. What will be the age of Nikita after 5 years? Nikita's age after 5 years = 12 + 5 = 17 years. Problems on Ages Practice Model Test Paper - 1 with Answer key and Detailed Solution.